Disc golf is one of the fastest-growing sports in the country, with membership in the Professional Disc Golf Association reporting its biggest membership increase yet: The organization now has more than 35,000 regular members and some 90,000 lifetime members. As a result, links are popping up all over the country, many of those official PDGA courses. (To be recognized as an official PDGA course, builders have to follow a strict set of design requirements that the organization has established.) 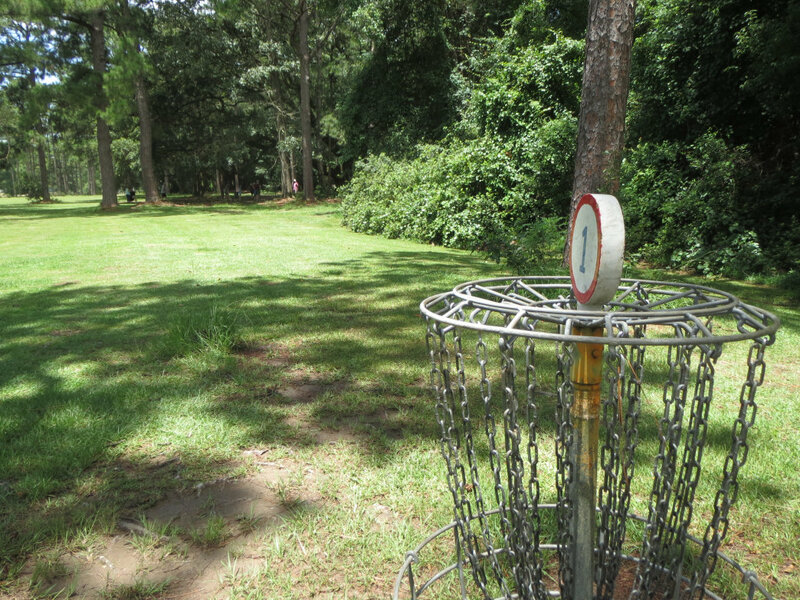 And, even better news for disc golf enthusiasts in Alabama: There plenty of amazing courses to choose from in the Alabama Gulf Coast. You can learn more about disc golf on the coast on the Mobile Area Disc Golf Association’s Facebook page. With plenty of hiking and biking trails and a kayak launch into the park’s namesake creek, Graham Creek Nature Preserve is an already popular destination for outdoor enthusiasts. And with two excellent 18-hole disc golf courses, there’s even more reason to visit. The Prairie is an amateur course across fields of rolling grassy hills with a couple of small creeks. The Preserve is for more advanced golfers, with difficult shots through a thick, brushy forest. Both courses feature cement tee pads. 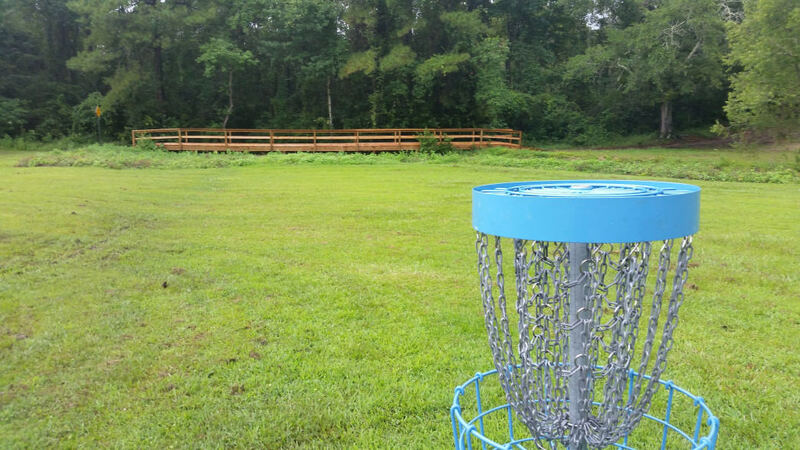 With a nice view of Bay la Launch and the Intracoastal Waterway, the 9-hole Osprey Disc Golf Course in Orange Beach provides a challenge with plenty of trees and shrubs as you round the course. What do you do with an old and unused traditional golf course? Convert it into a disc golf course! That’s exactly what Daphne city officials and the Lake Forest Property Owner’s Association did, re-inventing the subdivision’s old 11-acre golf course into an outstanding 18-hole disc golf course. The course features cement tees, plenty of hills—a rarity on the Alabama Gulf Coast—and views of the city of Daphne and Mobile Bay. Another bonus? The old golf cart path has been transformed into a bike and walking path. A deceptively short course, the Fairways of Fairhope at the Volanta Sports Park boasts 20 holes including one especially long one, the 403-foot hole #6. You will definitely find challenges here, with narrow fairways lined with thick foliage and plenty of trees to navigate. The course plays host to the annual Jubilee Tournament for cash and prizes with proceeds going to local charities. 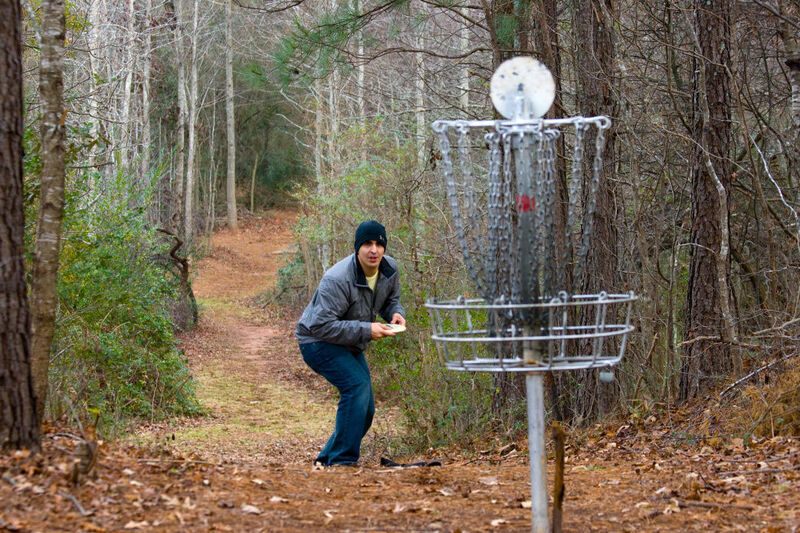 Nestled on the campus of the first Catholic college in the southeast (established in 1830), the Springhill College Disc Golf Course is touted as being "thrilling and rigorous". It’s all that and more as you wind your way around the 20 holes past Mirror Lake, along the Avenue of Oaks, over ditches, and up hills. 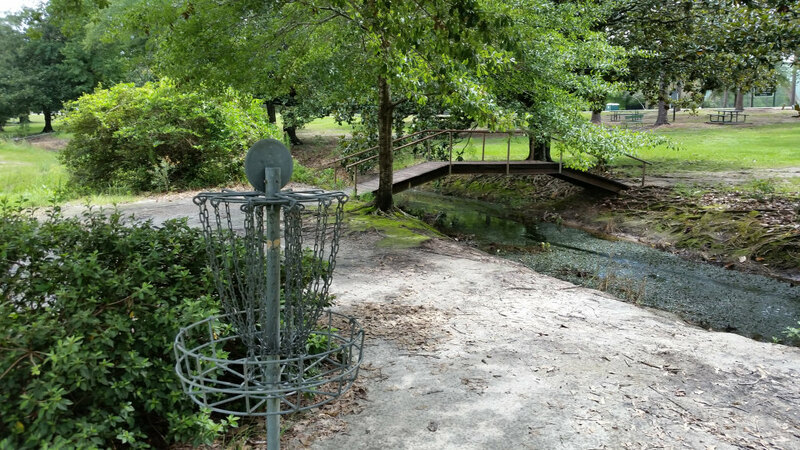 Not far down the road from Springhill College, you’ll find the University of South Alabama Disc Golf Course. The 18-hole course, which was redesigned in 2012, is narrow and tree lined, but there’s one section with great views of a wetland along Three Mile Creek that winds through the campus. Keep in mind that you’ll need to play after 5 pm or on weekends while school is in session. John Houck is a household name in the world of disc golf having designed hundreds of courses across the country. His 100th is a championship-caliber course in the town of Semmes, just north of Mobile, in Semmes Municipal Park. It’s called The Admiral, a full 20-hole course that’s pretty flat but heavily wooded, making each hole a challenge; upping the ante are water features. features. The challenge at the city of Mobile’s Municipal Park (also known as Langan Park) is the pine trees—lots of them—giving you ample opportunity to test your accuracy. The course is relatively flat with a beautiful lake adjacent to the course and a creek to play through. And, with a large playground, there’s something for the kids, too. Keep in mind that the popular course is often crowded on weekends, and it also hosts several large tournaments. PDGA describes Cottage Hill Park as being "an oasis in the middle of the city", and that it is. Tucked in between a myriad of subdivisions, the 18-hole gem features tight fairways that are lined with trees that will test the accuracy and light touch of even the best golfers. 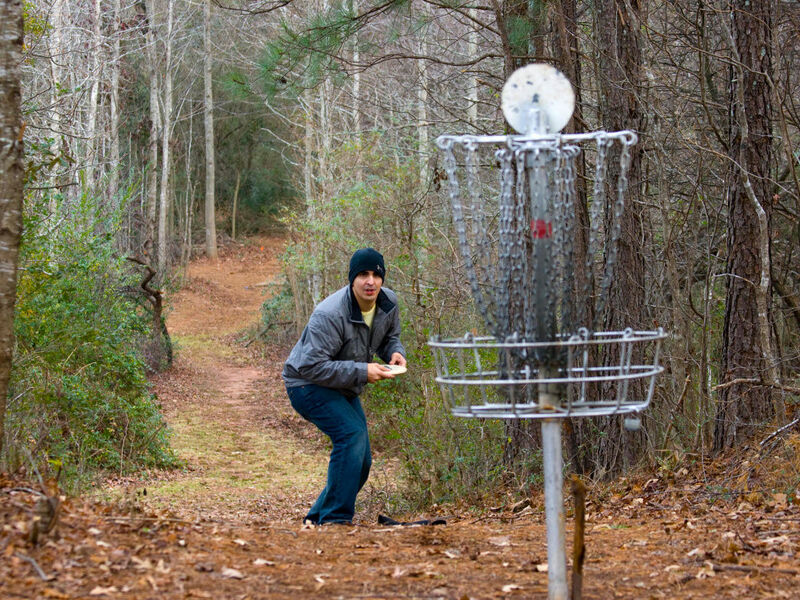 Chickasabogue Park is well known for its hiking and mountain biking trails as well as kayaking, but it has also become a popular disc golf destination. Located in northern Mobile County (Eight Mile, Alabama, to be exact), the 18-hole course has narrow fairways dotted with pine trees. This is an 18-hole course over gently rolling hills. If you don’t have gear stop by the main office at the park’s entrance where they sell or rent discs. The course hosts many local tournaments including a regular Thursday afternoon event as well as the "Halloween Howler" at the end of October where locals decorate their favorite holes, play a few rounds, and have a big cookout.